My fourth reflection paper is on the 1982 movie Gandhi, also considering parts of Gandhi’s 1927 Autobiography: The Story of My Experiments with Truth. I saw the movie when it was released but this is the first time I have watched it since I made two trips to create mentoring programs in Bangalore (now Bengaluru), India. I have the deepest respect for Gandhi and his remarkable accomplishments. Watching the movie again and reading his writing have only increased my appreciation for this great and humble man. It would be hard to overstate my admiration for Gandhi as a role model for generosity of soul, vision, non-violent change, organization and communication. 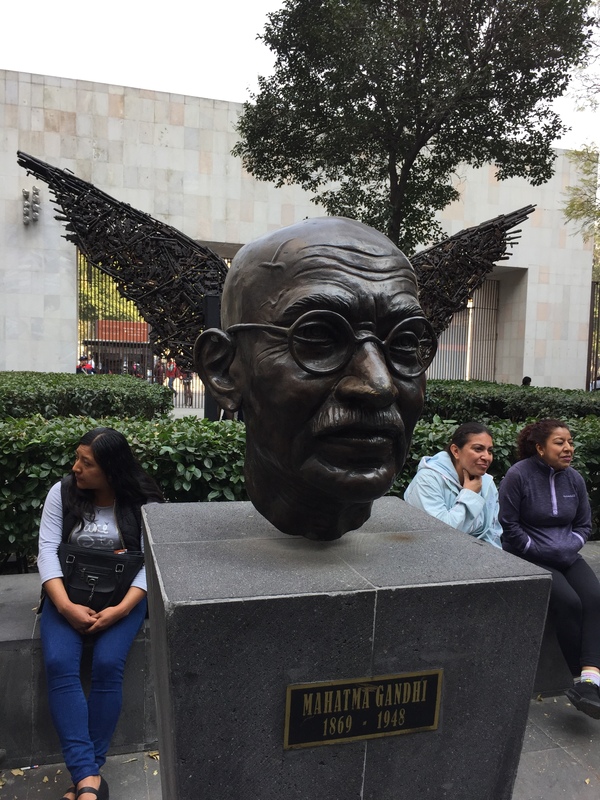 I have in my mind’s eye three bronze statues of Gandhi, one in Gandhi Square, Johannesburg, South Africa, another in Washington D.C. near Dupont Circle, and the third at the Museum of Memory and Tolerance, in Mexico City. For me, these heroic artworks represent the beginning and end of his story and illustrate parts of the movie. 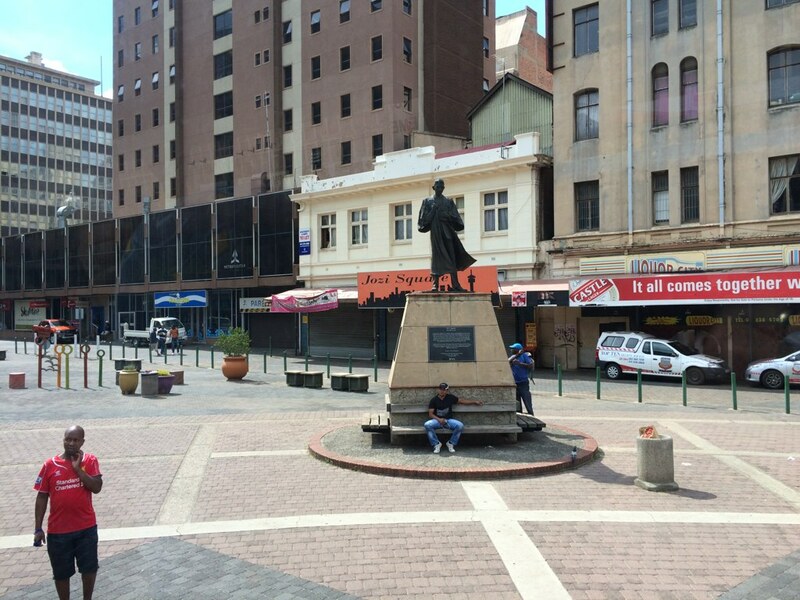 The statue in Johannesburg shows Gandhi in a legal gown over his suit, as he would have appeared as a young lawyer. He is reading a book, looking forward, and stands on a high plinth in a large public square. When I saw the statue in 2015, several men were lounging comfortably on the plinth base. The statue represents the young Gandhi at the beginning of the movie, a man who is making his professional way in Johannesburg, working inside the British system. The statue in Washington D.C. in front of the Embassy of India is very different. Over life size, the bronze shows Gandhi as an older man, striding along wearing very little and using a long staff. The red stone base says, “My Life is My Message.” This represents the Gandhi who walked modestly among his people, getting his social justice and political work done by force of personality. I make a small pilgrimage to Gandhi’s statue every time I go to Washington D.C. It feels like visiting an old friend. The final Gandhi statue is a bust in a line in front of the museum along with busts of Nelson Mandela, Mother Teresa, and the Rev. Dr. Martin Luther King. 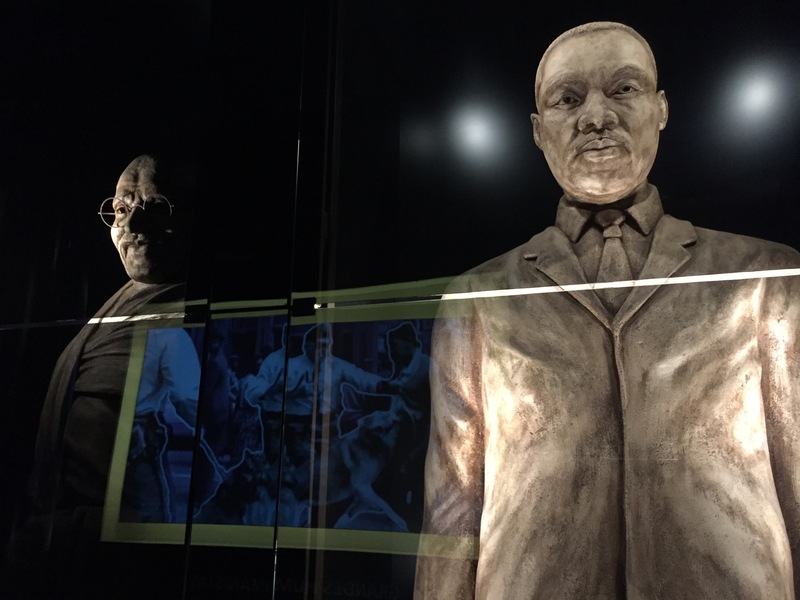 Four more larger than life statues of these great leaders make up the final exhibit of the museum, representing heroism and hope. Our Pacific School of Religion – Mexico immersion class visited the Museum of Memory and Tolerance in January 2019. Gandhi is represented among those who inspire the whole world to change for the better. In the “Face to Face with Ahimsa” section of Gandhi’s autobiography, I was inspired by how much love was a part of his effectiveness as a catalyst for social change. Gandhi writes, “The people had for the moment lost all fear of punishment and yielded obedience to the power of love which their new friend exercised.” Gandhi uses the word ahimsa, meaning respect for living things and avoidance of violence, to describe how he interacted with the people of Champaran, in India at the foot of the Himalayas. He writes, “It is no exaggeration, but the literal truth to say that in this meeting with the peasants, I was face to face with God, Ahimsa and Truth. When I come to examine my title to this realization, I find nothing but my love for the people.” The emotional connection between Gandhi and the people of India was profound. His leadership of the movement for Indian independence against British colonial rule was so effective not only because he was a great strategist, organizer, and communicator but also because he lead from love. I too have found that my best ideas and most effective communications come when I lead from my heart. Gandhi is so important and beloved in India that he is sometimes referred to by just his initials. In the several weeks I stayed in Bangalore, India, in 2004 and 2007, I learned that M.G. meant Mahatma Gandhi. For example, I attended church at St. Mark’s Cathedral, which has the address 1 M.G. Road. 10 It took me a while to understand that the Bangalore hotel clerk was not saying “emmgee” but rather “M.G.” when giving directions to the cathedral for Sunday services. Gandhi is entirely deserving of this deep affection and respect by his nation, by the world, and by me. Gandhi, directed by Richard Attenborough, featuring Ben Kingsley (Columbia Pictures, 1982). Mohandas K. Gandhi, Autobiography: The Story of My Experiments with Truth, trans. Mahadev Desai (New York: Dover Publications, 1983). “Mahatma Gandhi Memorial (Washington, D.C.),” Wikipedia, last modified 2 April 2017, https://en.wikipedia.org/wiki/Mahatma_Gandhi_Memorial_(Washington,_D.C.). “Statue of Mahatma Gandhi, Johannesburg,” Wikipedia, last modified 19 August 2017, https://en.wikipedia.org/wiki/Statue_of_Mahatma_Gandhi,_Johannesburg. “Memory and Tolerance Museum (Museo Memoria y Tolerancia),” CDMX – Ciudad de Mexico, accessed 11 March 2019, http://cdmxtravel.com/en/attractions/memory-and-tolerance-museum-museo-memoria-y-tolerancia.html. “TechWomen Tour Johannesburg,” Katysblog (blog), 25 January 2015, https://katysblog.wordpress.com/2015/01/25/techwomen-tour-johannesburg/. “Communities of Liberation, Cuernavaca Mexico (5),” Katysblog (blog), 30 January 2019, https://katysblog.wordpress.com/2019/01/30/communities-of-liberation-cuernavaca-mexico-5/. “St. Mark’s Cathedral, Bangalore,” St. Mark’s Cathedral, Bangalore, last modified 2017, http://saintmarks.in.